The Hulk can be a tough character to write for. After all, the character has had two separate film adaptations in the past decade, with neither Ang Lee’s Hulk nor Louis Leterrier’s The Incredible Hulk serving as wholly satisfying experiences. 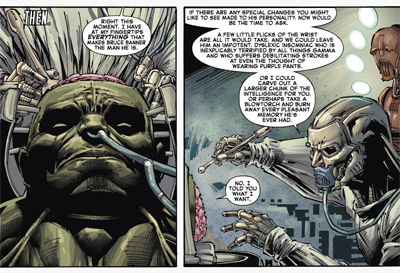 The character has presented a similar problem in comics. Despite the fact that the Green Goliath is one of the most iconic comic book characters in the world, it’s very hard to find or recommend classic stories featuring the character. His emergence in the Silver Age was a long and painful process, as the company tried to figure out what to do with him. Peter David’s extended run on the character stands as perhaps the most respected collection of stories focusing on the character, but it seems like the Hulk has been hard for many writers to get to grips with. And it’s not from lack of trying. I suspect it’s the fact that the central dynamic is so archetypal, and so iconic. It’s hard to take a conflict that was compelling in The Strange Case of Doctor Jekyll and Mister Hyde, and turn it into a monthly comic that has been published on-and-off for about half a century. There comes a point where there’s really only so deep you can delve into the conflict between a man and the monster inside of him, before it seems a little rote and a little familiar. Perhaps that’s why so much effort has been expended trying out new things for the character in recent years. 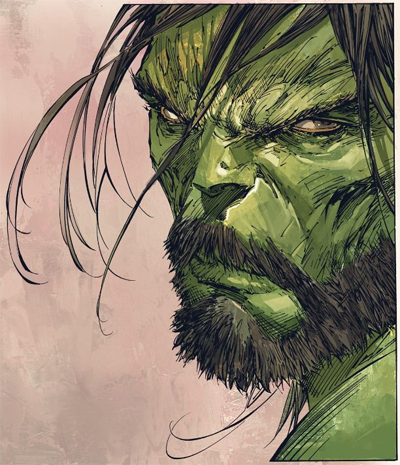 In Planet Hulk, for example, the Hulk got to play the hero of an interplanetary romance, to great success. In World War Hulks, everybody became a Hulk, to far less success. Indeed, Aaron himself seems to mock the abundance of Hulks in today’s Marvel comics, making Banner’s predicament seem almost tragi-comic. “At last count, pretty much everyone I’ve ever known is a Hulk,” he laments, in a line that perfectly underscore’s Aaron’s ability to recognise (and embrace) the absurdity of modern comic books while still finding a hint of humanity buried somewhere. The fact that we have nonsense like Red Hulk or Red She-Hulk is nothing but an attempt to franchise the character, but it makes Banner’s inability to transform seem all the more pathetic. These modern stories, however, feel a little unsatisfying because they avoid the central conflict of the character, what has become the focal point of the character’s appeal. 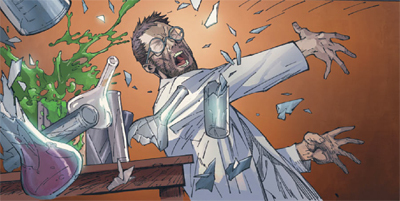 When you mention The Incredible Hulk to a random person, they immediately picture a nerdy scientist dealing with a giant green rage monster inside of him. So other takes on the character are fascinating, clever and insightful, but losing that central conflict feels like drifting away from the heart of the character, losing sight of what is important. 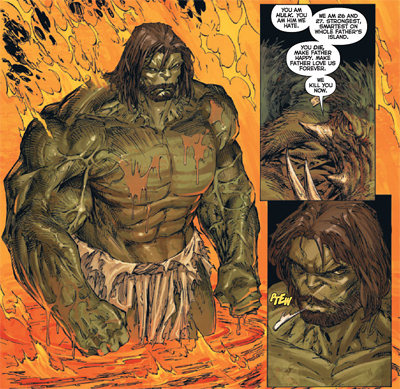 So Aaron embraces the conflict between Bruce Banner and the Hulk, which presents its own set of problems. After all, this is a story that has been told. Aaron hits upon an interesting theme, though, something that feels like a novel approach to the most famous internal conflict in comic books. What if Bruce Banner is the villain? What if the Hulk is really just an innocent victim in all this? It’s a fascinating take on the character. After all, the default position is to pity Bruce Banner. He’s just a scientist who was in the wrong place at the wrong time. Now, if he happens to get angry, he turns into a monster and causes untold destruction. Because of that monster who emerges when Bruce loses his temper, Banner has watched his life implode. He has been hunted, chased, hounded. He has lost everything that ever mattered. He has suffered for this affliction he can’t control. Aaron’s central premise is to take that portrayal and turn it on its head. The Hulk, according to Aaron, is the real victim. 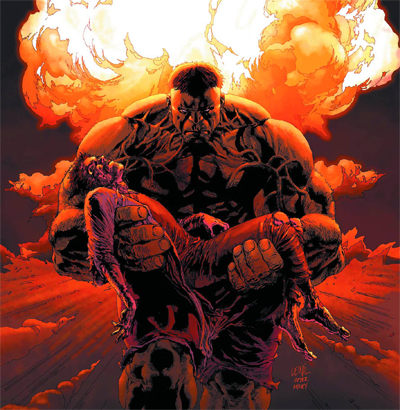 Created inside Banner’s mind during a traumatic childhood, the Hulk became the dumping ground for all of Banner’s anger and rage and insecurity. The Hulk is bottled up inside until he bursts out. 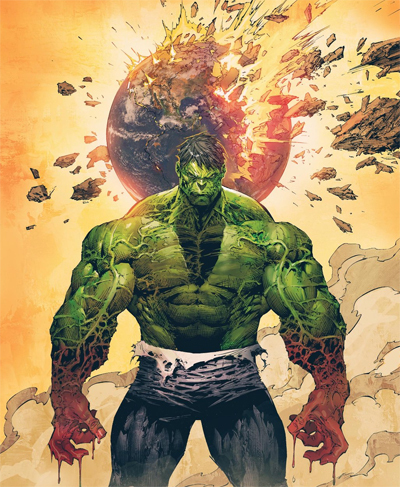 “Imagine having the strength to break worlds,” he remarks at one point, “but not to control your own destiny.” Being feared and hated for something that the Hulk has no control over, it’s a truly pitiable state of affairs. The answer is almost heartbreaking. “Because it’s all I have,” Banner confesses. Later on, he admits, “The Hulk was an accident. A colossal blunder. But it was also the only thing of note I have ever accomplished in my life.” While it’s easy to feel sorry for the guy, it’s also worth conceding that he isn’t an unambiguous hero, or a pure victim. He’s a sad and lonely scientist whose most significant accomplishment is a gigantic screw-up while trying to build something that could kill millions of people. It should be conceded that this portrayal of Banner isn’t entirely original or unique. Writers have been playing with the idea that Banner might not be the better half of the equation for quite some time. Indeed, even in Planet Hulk, the Hulk had nightmares about Banner coming back to reclaim his body and destroy everything that the Hulk had built, a reversal of their traditional roles. 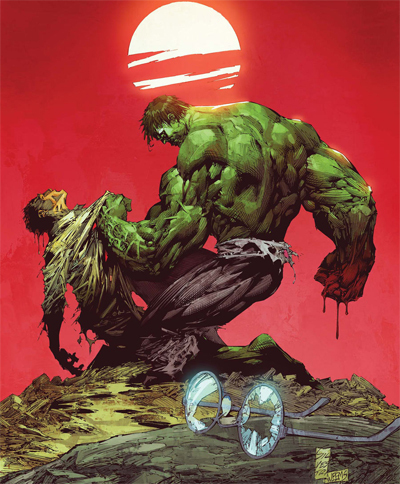 Still, Aaron’s run on The Incredible Hulk offers a more thorough reversal of the traditional dynamic, building an entire sixteen-issue run around the inversion. 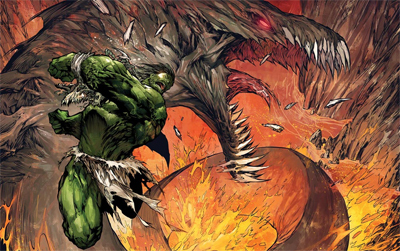 Rather sharply, it isn’t only the relationship between Banner and the Hulk that Aaron flips on its head. His entire run on The Incredible Hulk feels like something of an inversion of a traditional comic book run. He starts at the end of the story, the radically altered state of affairs, with his hero living in tranquillity, having accomplished what he needed to accomplish. Then, starting from the end, Aaron pushes The Incredible Hulk back towards the status quo, in the direction of the default setting for the Hulk. It’s a fascinating (and clever) reversal. Happiness. Peace. These are things I learned long ago never to trust. It was Banner who taught me that. Banner who was afraid. Banner whose weakness always held me back. But Banner is not here anymore. That part of me is dead. I killed it. I killed everything inside me that was Banner. I killed it dead so that the Hulk might finally live. 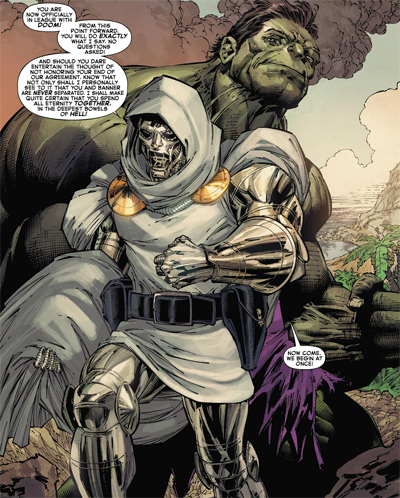 Indeed, after completing the procedure to separate the two, Doctor Doom asks, “What does the Hulk truly want?” Apparently, the Hulk wants the same thing that any other fictional character wants. A happy ending. And Aaron opens his sixteen-issue run by giving the Hulk that happy ending, even going so far as to have it occur off-panel. The end of Aaron’s run doesn’t represent a radical shift in the status quo, or a dramatic change to the Hulk’s somewhat typical circumstances. 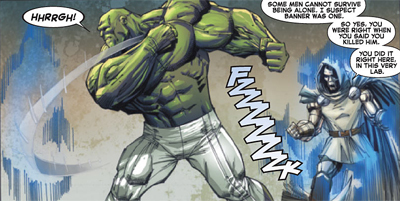 Indeed, the final page assures the reader that the Hulk and Bruce Banner are back to sharing the same body, in the typical arrangement. If Bruce Banner gets angry, the Hulk comes out. The difference, of course, is that Aaron suggests that both have made peace with that. 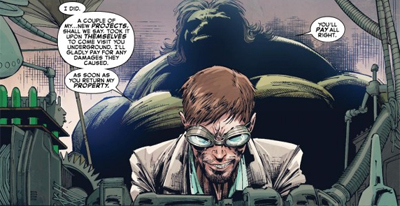 In his videotaped apology to the Hulk, for everything that he has done, Banner confesses that he has come to some sort of understanding about the way that things work out. “That day I got caught in the Gamma Bomb explosion,” he explains, “I thought for the longest time that day ruined my life. But I was wrong. That day saved me.” Of course, it seems unlikely that this new status quo will last too long, with Banner and the Hulk at peace. Editorial will undoubtedly want a return to the iconic conflict. And Aaron has brought the character back close enough to the classic status quo that it should be easy enough to return to that model. Still, it’s a suitable place to end the run. And Aaron’s decision to open his tenure on The Incredible Hulk with what might seem like an ending, only to bring the book back towards the status quo, represents a very clever use of the narrative laws of comic books. After all, writers can never change things too dramatically. There always has to be enough left for the next writer to pick up the character and tell their own story. Aaron shrewdly opens with his radical shift to the character’s dynamic, so returning the character to his “normal” default status allows Aaron to creative movement and a clear character arc. It’s very clever, from a structural point of view. However, Aaron’s run is far from perfect. He doesn’t have quite the same level of synergy on The Incredible Hulk as he did on Ghost Rider or Wolverine. 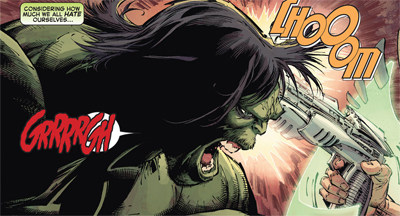 Part of that is probably down to the fact that the Hulk, as a primarily psychological character, doesn’t lend himself to the same sort of high-intensity pulp as either of those two leads. Aaron’s Ghost Rider was pure grindhouse pulp, while his Wolverine was about a character dealing with the fact that his life exists in this massive shared universe. In contrast, The Incredible Hulk is primarily focused on the relationship between Banner and the Hulk, and Aaron’s use of rapid-fire pulpy concepts doesn’t work nearly as well here. Which is a shame, because quite a few of the ideas are wonderful, betraying Aaron’s obvious affection for the “anything goes” approach to comic book writing.this isn’t to say that any of them aren’t intriguing or satisfying in their own right, just that they seem at odds with the more personal conflict between Banner and the Hulk. Aaron’s run also suffers because it feels a little truncated. The conflict between Banner and the Hulk is barely set up before it is resolved. Stay Angry, Aaron’s second extended arc on the title, moves so fast and so randomly that it feels like the writer isn’t quite settling in. It feels rather disjointed, as it’s meant to – after all, each story opens with the Hulk waking up in a strange place, after Banner has done something dubious. So we get an almost stream-of-consciousness narrative and repeated rapid genre shift. The arc takes the Hulk all over the Marvel Universe, from “an underwater hick town” to a Russian space station named “Neverlab” to the “hidden city of Sasquatches.” These are entertaining, if a little too random and too surreal. On the other hand, it is great to see Aaron write the Punisher again. (Any chance of a nice omnibus of Aaron’s Punisher MAX?) And pairing Kraven up with the Green Goliath is an inspired choice. And then the finalé happens, with Doctor Doom. Except for the fact that it seems like Jonathan Hickman’s Fantastic Four and Future Foundation must have been using the character, so it seems like the Hulk is forced to smash copious amounts of Doombots. It’s not a satisfying end to the conflict between the Hulk and Doctor Doom, which seems set up to be one of the run’s threads. Pairing the Hulk (and Banner) against Doctor Doom is an inspired touch. One of the great things about Doom as a villain is that he works fantastically as a foil to so many of Marvel’s iconic heroes. Pitting Banner (the failed scientist) against the genius of Doom is a very clever idea. The artwork for Aaron’s run on The Incredible Hulk is more than a little disjointed. Marc Silvestri was the original artist, but he had to step away from the book after he was hospitalised. The resulting artwork is a little uneven and all over the shop – there’s not too much consistency. It is great, for example, to have Aaron reteaming with Steve Dillon on the Punisher, but asking Steve Dillon to draw strange dog-men feels like a waste of his talent. Aaron’s run on The Incredible Hulk isn’t a classic run, but it is a fun one. It’s packed with clever ideas that don’t always gel as well together as they might. Still, there’s a pulpy charm to it all, and Aaron’s work always has a fun and engaging quality. While this isn’t Aaron’s best Marvel work, nor the best comic book run to feature the Hulk, it is still an intriguing comic book, albeit one that is occasionally a little uneven or inconsistent. I really enjoyed your blog here. I’ve met Jason Aaron in Norfolk, VA and I LOVED his graphic novel The Other Side. I really have wanted to get into his more recent things and, although he’s far from perfect (I don’t know anyone who claims that they are), I believe he is a wonderful writer with some amazingly clever ideas. Upon meeting him, he completely comes off that way. Great guy. Great post. Reblogged this on Azee Graphics.